I have admired Trakke for a long time for bringing quality manufacturing back to Scotland (Glagsow in particular); nurturing artisanal skills that have otherwise been lost over the past few decades. 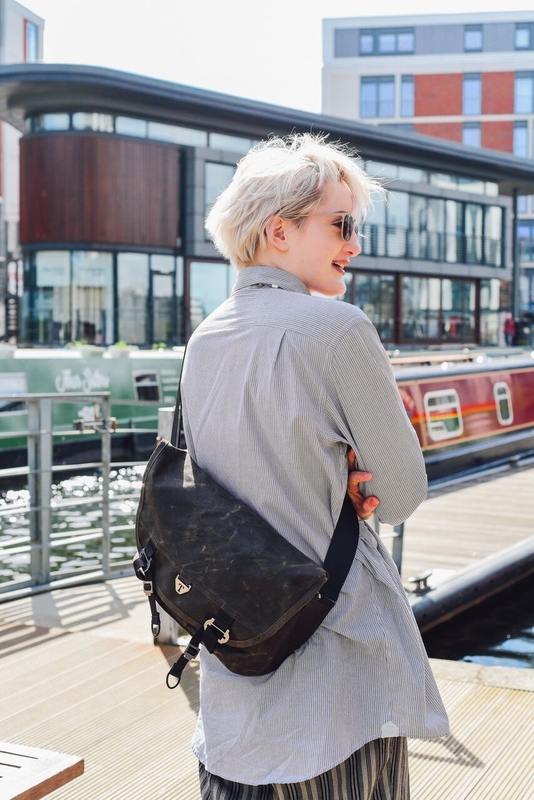 Every single bag that this unique ethical fashion brand is proudly emblazoned with the words 'Handmade in Scotland', and its components are proudly sourced from the best possible suppliers and manufacturers around the UK, making every product to last to accompany you on every adventure across your lifetime. Plus, these waxed cotton beauties are 100% vegan. Result! I was thrilled to be able to shoot this outfit with my talented friend and fashion photographer extraordinaire Ellie Morag on a sunny but seriously windy (evidence in my crazy hair) morning at Edinburgh's Canal basin last week. 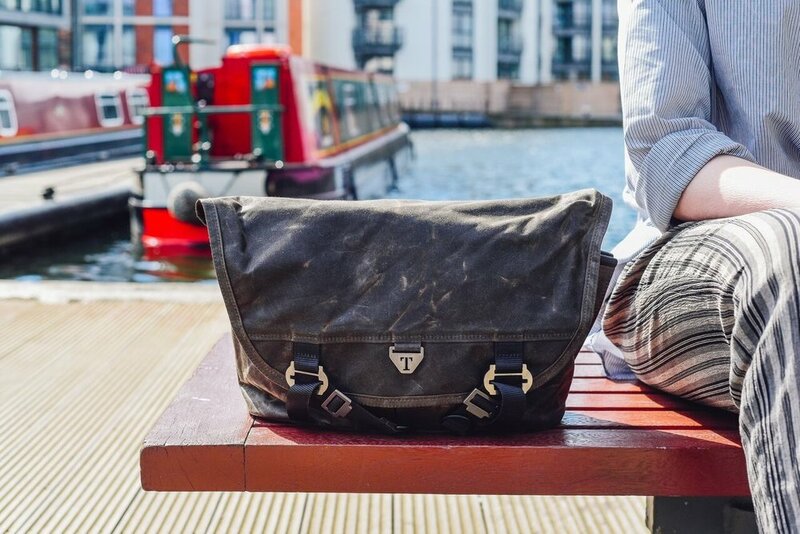 Trakke sent me the 'Bairn' bag, a mini-messenger for the urban traveller, in a beautiful olive colour, which is a cool cross-body fit made perfectly for cyclcing, a hobby I have been picking up again more and more since the weather's been brightening up. I love the vibrant orange lining, and the shape and size is ideal for travelling by foot or by bike to work or meetings, and it even fits my laptop as well as a book or two inside! I decided to style the Trakke bag with an androgynous look to complement its outdoorsy feel. I wore a men's blue and white pinstripe shirt from Edinburgh tailoring and tweed label Walker Slater, which I recently bought for just £20 at the brand's outlet store on Victoria Street, with some cropped vinatge striped trousers from Godiva Boutique on Edinburgh's West Port. i accessorised the look with a ceramic necklace by contemporary jeweller Beth Lamont, a resident of Coburg House art studios, my much-worn sunglasses by Glasgow eyewear makers Iolla, and Comme des Garcons x Converse trainers. On a final note, his month I've been taking part in the #slowfashionchallenge on Instagram, and what I've realised is that huge benefit of shopping from local brands is the transparency you can get; you can meet the people who actually design and make your clothes and learn their story. This for me is the true joy of fashion; cherishing creativity, quality and human narratives. It just happens to be ethical by proxy, especially here in Scotland where we have a wealth of natural textiles, innovative brands and incredible manufacturing at our doorstep! So I'm celebrating, more than I even do already, the incredible breadth of talent in this small but mighty country. Viva Scottish fashion!